Emperor Qin Shihuangdi was born in 259 BCE. His name at birth was Zheng. His father, Zhuang Xiang was king of Qin and his mother was, Jhao Ji, a merchant’s former concubine. His ancestors originated in the steppes in western China. 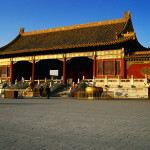 When his father died in 246 BCE, he became King Zheng at the ripe old age of 13. Working with his ministers, his government was centralized in its capital, Xianyang, where it ruled by fear. Farming, on a wide scale, helped to assure that his armies were well fed and well provisioned. His troops were well trained and became a force that neighboring states could not equal in terms of size, strength, and evilness as all enemies taken in battle were killed. Zheng’s armies conquered all neighboring states, until in 221 BCE, when all opposition to his rule was gone and King Zheng declared himself Emperor Qin Shihuangdi (Qin Shi Huangdi), “The First August Emperor”. The previous dynasty, Zhou (1100-256 BCE), was no more and the Qin dynasty had begun. Emperor Qin Shihuangdi’s unification of the warring states brought stability to a region that needed it greatly. But Qin Shihuangdi didn’t just wage war and unite the region. He was an empire maker. He rebuilt sections of the “wall of ten thousand LI” or what is now known in the West as the Great Wall of China. Although begun in the 4th century BCE, the wall was not a solid wall. Emperor Qin Shihunagdi ordered the sections linked and supported with manned fortifications, which created a 2,500-mile barrier between his kingdom and the West. The people under Qin Shihuangdi’s rule were subjected to new laws, which allowed them few freedoms and essentially made them wards of the state. They were made into producers whose only job was to provide to the state, such as being farmers and soldiers. Intellectuals, religious leaders, teachers, and merchants were seen as evil and nonproductive. Books were burned and those intellectuals resisting the new order were forced into labor or killed (some were buried alive). The state became the leader and teacher providing all of the needs of the populace. Emperor Qin Shihuangdi, as the head of state, had ultimate and absolute power. This means of ruling the people was called Legalism. Punishment was swift and occurred often. Families, who had ruled prior to this new emperor’s rule, were forced to live in replicas of their former palaces. All weapons held by those other than soldiers were required to be turned in and were subsequently melted down. There were, however, positive outcomes in Qin Shihuangdi’s government. Wide thoroughfares were built to link provinces, which made travel easier. Standardization of weights, measures, money, and written language was developed and enforced. 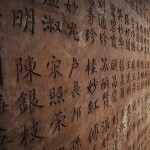 With writing, a common set of 3,000 characters were developed that set a basis for the Chinese language we know today. Over time, Qin Shihuangdi became increasingly scared of dying. Multiple assassination attempts were made on his life. He moved into new palaces often and used other carriages and people as decoys to avoid detection by those who meant him harm. He wanted to be immortal and took many elixirs and herbal mixtures in an attempt to remain alive forever. Unfortunately, none of these precautions could keep Emperor Qin Shihuangdi alive as he died in 210 BCE while on a trip to the eastern coast of China. His tomb, located in Mount Li, Lintong, Shaanxi, is now famous for its terracotta army of over 7000 warriors discovered in 1974 CE. Although no records exist of his wives or concubines, Qin Shihuangdi fathered over 20 children. Emperor Qin Shuangdi was succeeded by his son, Er Shi, as the next emperor of the Qin dynasty. * Emperor Qin Shihuangdi image courtesy Wikipedia Commons. This is a faithful photographic reproduction (a mere record copy) of an original two-dimensional work of art. The work of art itself is in the public domain because its copyright has expired.